Receipts are usually an acknowledgment for a transfer of goods or services. A medical receipt is issued when any set of services or single service regarding the medical field are provided. A medical receipt is a document used in the clinic of the doctor in order to issue the bill to the patient. This receipt helps a patient/doctor keep track of his income. The patient is required to keep the medical receipt with him since it enables him to request for compensation to an insurance company. Some people are also required to show these receipts to the government before paying the tax. A medical receipt displays the detail information regarding the services provided, the charges pertaining to these services, by whom the services were given, to whom these services were rendered, medical insurance information if was required. Why is a medical receipt important? Any person visiting the clinic and rendering the Medical services is liable to pay for those services. The amount he should pay can be seen through the medical receipt. The patient is advised not to pay until he doesn’t receive the receipt. A medical receipt is not just important for the service provider but also for the patient or customer. For the medical care provider, the significance of the receipt is because they have to keep a record of which tests or diagnostic facilities are used for further research. Also, the budget and evaluation of financials are also dependent on the accumulation of all the medical receipts issued. For the patients, these receipts are recorded for their medical diagnostic file. Also if medical bill reimbursement is to be claimed later, then this receipt is vital. The templates available on the internet are of different formats. You can select the one whose layout and detail is relevant to the medical care facilities that you provide. Usually, all you have to do is insert your logo in the selected template along with the name of your medical center and its address. The rest of the fields are not fixed as they pertain to the patient or your client. After setting your logo and address you are good to go. You can use this template as both an email receipt and printed receipt. You can get them printed in bulk and keep to be filled with hand or print a copy each time. What are the benefits of medical receipt template? 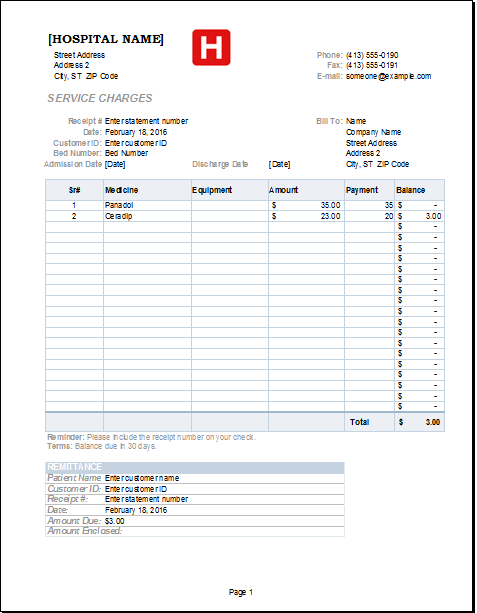 In order to keep track of the monetary details, the medial receipt template is a useful tool to be used. Since the receipt includes the type of services provided to the patient, these receipts can be used by the doctor to keep a check on the services that are provided to the patient. This receipt template helps the user in creating the receipt quickly and thus helps in keeping track of the types and number of services utilized by the patients. Is the receipt provided by the template is not in accordance with the needs of the user, he can customize it to in order to omit the unnecessary or irrelevant details and add the details which are more meaningful and necessary for the user.